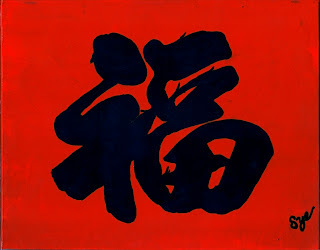 The Good Fortune Character or "Fook" character as it known in Chinese, is very popular and often used as it is believed to Good Fortune to all who display it. 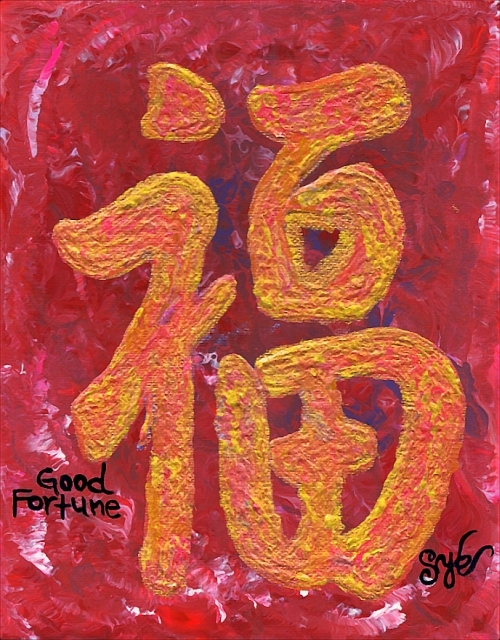 Use The Good Fortune Painting to stimulate your Career, Success and to attract Greater Opportunity into your life! 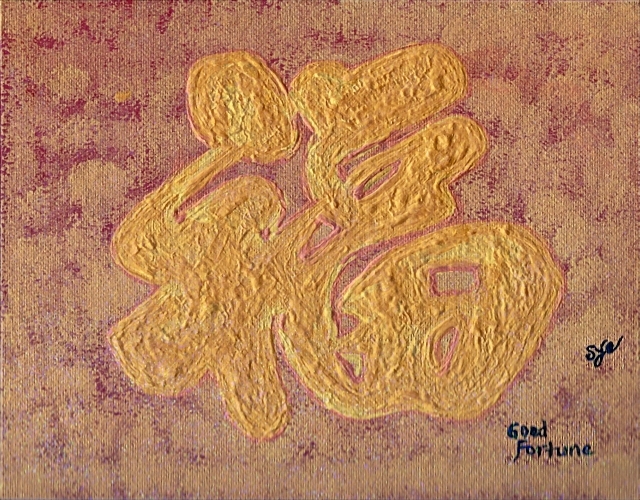 Golden Good Fortune by Sye Cheng! Chi is Life Force & Chi is Energy. 1 - Place the Chi Symbol in the North or in your Career area to stimulate success. 2 - Place the Chi Symbol in the South or in your Fame area to increase your recognition and amplify your reputation. The Love Character comprises three elements consisting of Heart, Breath and Grace. 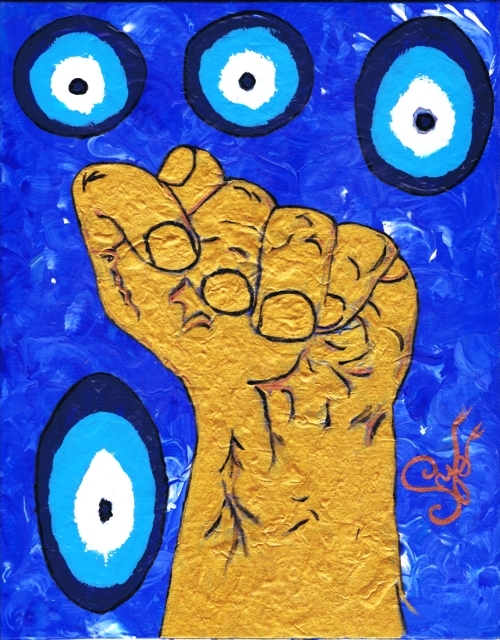 Display "The Love Painting" to strengthen and increase the Love Energy and Power in your relationships. Seal of Success by Sye Cheng. 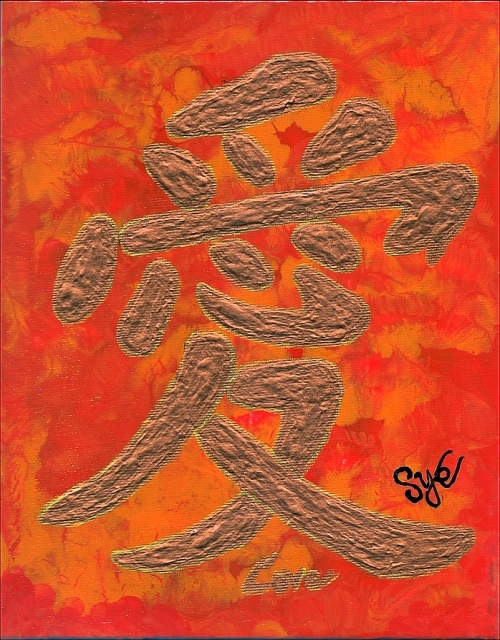 The Chien Hexagram is the first of the 64 Hexagrams (characters/symbols) of the I Ching. It is the ultimate symbol of Yang Energy. By placing images of Chien Hexagrams in the North West, the "Luck of Sublime Success" is created. 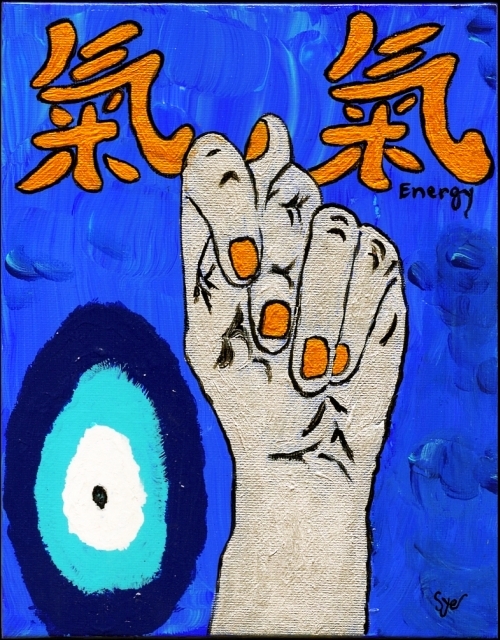 Chien creates light, giving active and spirited Chi, which attracts great amounts of Good Fortune! Chien is also said to bring Good Luck from Heaven, whose essence is Power. 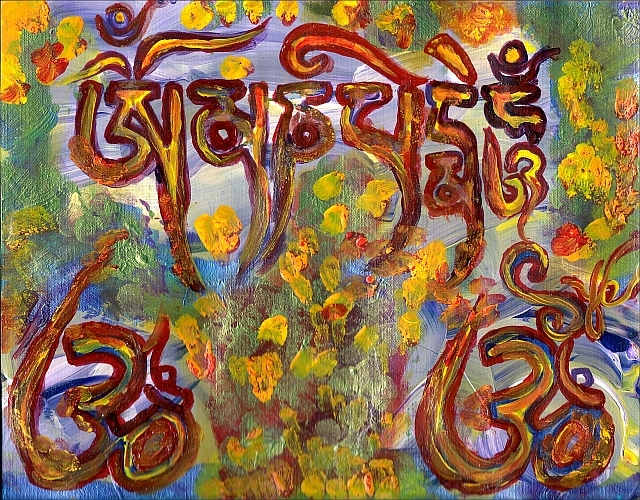 "It is very good to recite the mantra Om mani padme hum, but while you are doing it, you should be thinking on its meaning, for the meaning of the six syllables is great and vast... The first, Om, symbolizes the practitioner's impure body, speech, and mind; it also symbolizes the pure exalted body, speech, and mind of a Buddha. 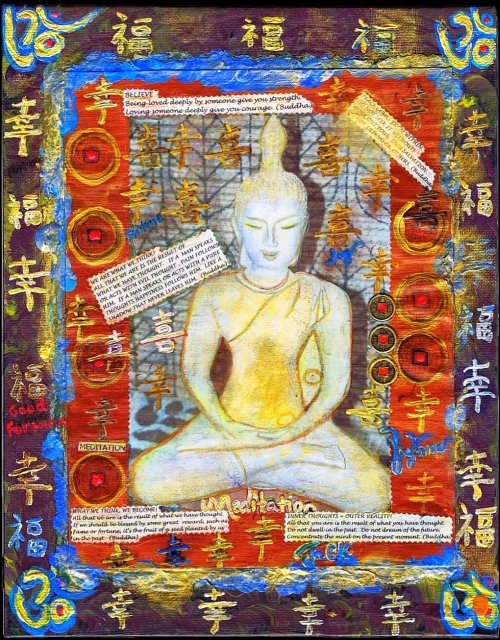 The six syllables, om mani padme hum, mean that in dependence on the practice of a path which is an indivisible union of method and wisdom, you can transform your impure body, speech, and mind into the pure exalted body, speech, and mind of a Buddha." The Sun creates passion and yang Energy. 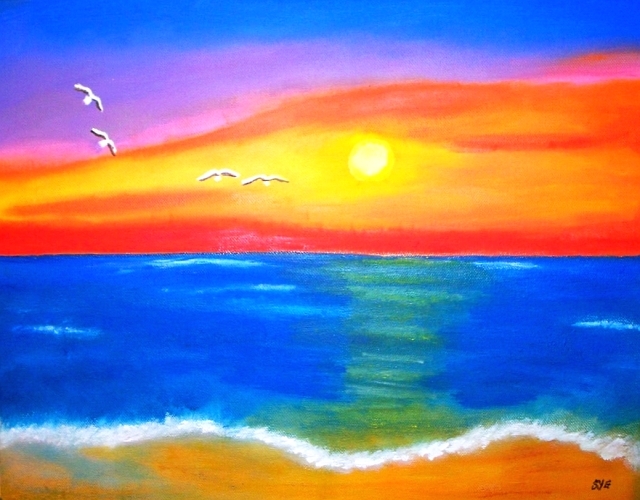 The Sunset painting can be used in decoration to help boost your social life. The South and Southwest areas represent the public and social spheres of your life. Displaying the Sun painting will attract lots of new friends , visitors and will bring good fortune to your business. Golden Protection Figa by Sye Cheng! 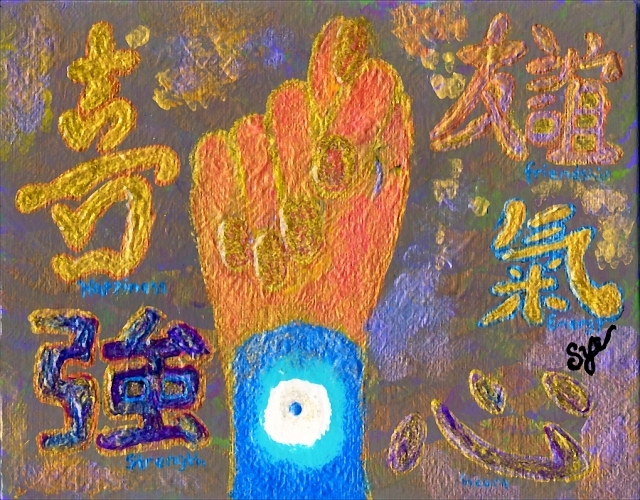 The Golden Protection Figa Painting displays Luminous symbols that represent Good Fortune, Prosperity, Success and Protection. 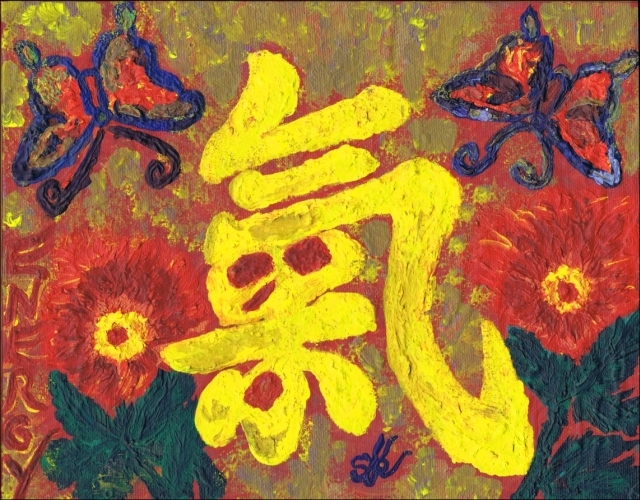 The left side of the painting includes the Happiness Character, which enhances the other symbols by adding the extra elements of Friendship, Strength and Heart Energy. The Figa as it is known in Brazil is an ancient symbol which was known as the "Fica" in Italy. It was popularized in Europe for many years and then was introduced into Brazil during one of the early European immigration waves. It has since become a very popular symbol in Brazil. It is believed that when given as a gift, the owner will be blessed with Luck and Fortune in all things. My Figa Art strives to continue this tradition and bring Luck and Fortune to those who possess it. I have added other cultural Luck and Fortune symbolgy as well to make it even more effective. Lucky Figa by Sye Cheng! 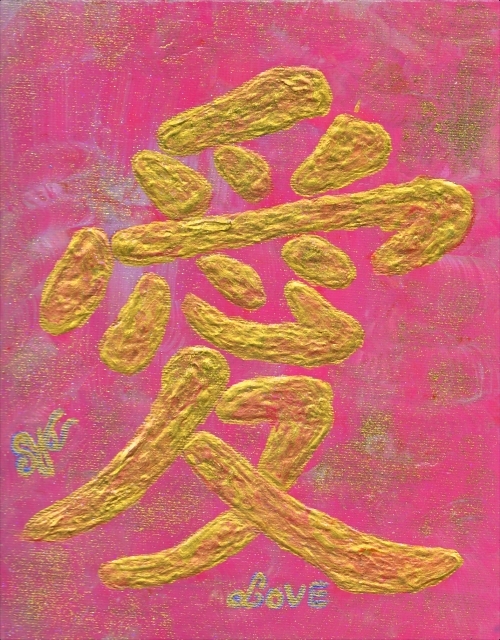 This painting displays luminous symbols which represent prosperity. Three coins, which are the three circles, represent Heaven. And the three squares In the middle represent Earth. There are two Chinese characters. One is “good fortune” and the second one is “Joy”. 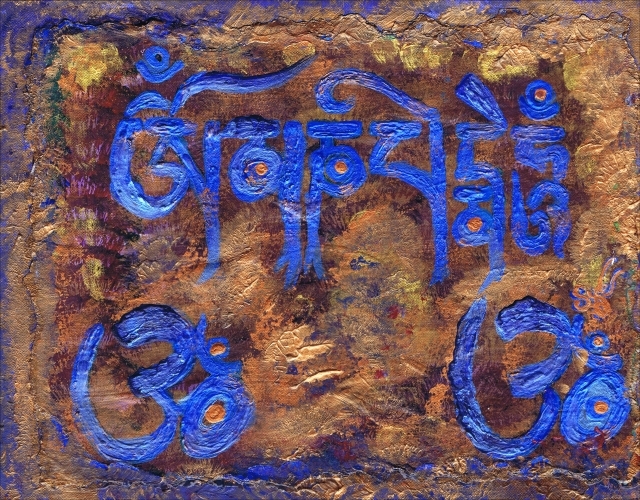 The symbol of “OM”, a mantra used during meditation, is the sound of the universal vibration. “OM”, is a sacred Sanskrit symbol of God as the absolute. 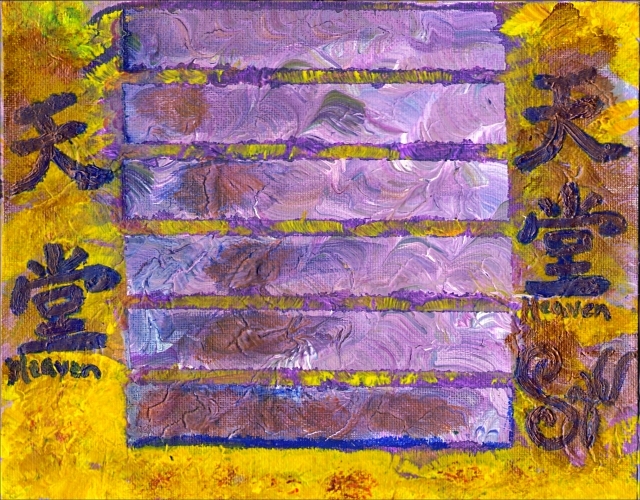 My hope is that through this painting, you will experience Boundless Blessings & Prosperity! 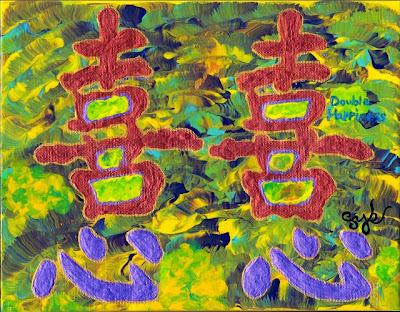 By Displaying the “Prosperity” painting, you will attract great fortune. Art can and should do more than just “look nice”. Art should strive to enhance one’s life. Art should improve the quality of one’s daily life experience by enhancing their health wealth and happiness. This artistic concept and genre is what I call Life Enhancement Art. It can rightly be argued that all art is “Life Enhancing” at some level, in that art of all types and media inspire and enrich our society. However I believe that Art can do more! The goal of each and every piece of art that I create for my clients is to enhance and improve their lives in some specific way. Life Enhancement Art is the concept of understanding my client’s desires and infusing their piece with their desired outcome. Before I start work on any piece I conduct a client consultation where I learn what their desired outcome for their piece will be. I also use their birth year and other life data to use in my process. Each person has specific colors and natural elements as well as Chinese Zodiac signs that play a crucial role in their daily lives. So it is essential that I know this information before commencing the creation of their Life Enhancing Art piece. To learn more about my art, please contact me to set up a consultation where we can discuss how my art can make your desired outcomes become a reality. Thank you for your time and for visiting my blog!